The vision of what’s happening in front is ultimately the most important part of good driving — so Tesla and EV enthusiast and winner of 2 next-gen Tesla Roadsters, Bjørn Nyland recorded a video for us while testing Tesla Model 3 headlights. 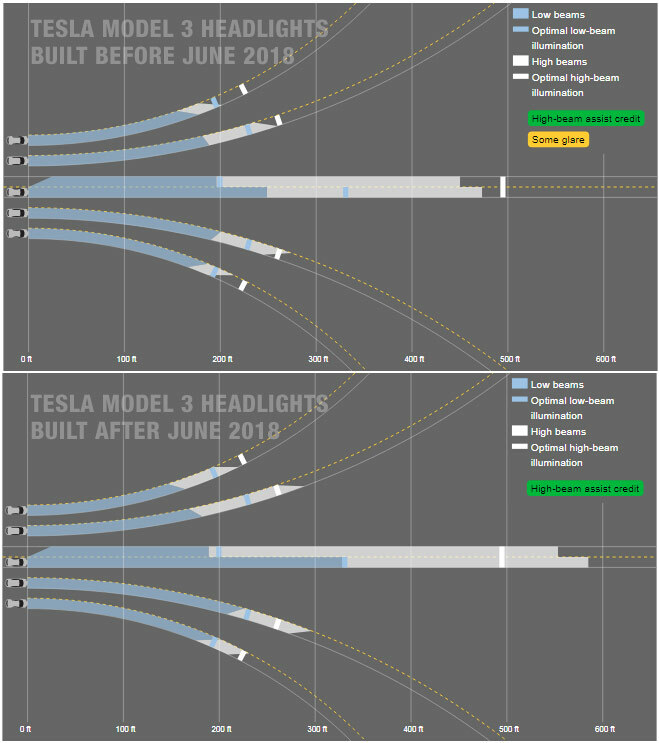 Recently Insurance Institute for Highway Safety (IIHS) conducted a thorough test of the Tesla Model 3 headlights and posted the results on their website for both the updated version of the headlamps (built after June 2018) and the older version (built before June 2018) (comparison charts and result tables below). IIHS, although rated the older version of the headlights ‘Acceptable’, the new Tesla Model 3 headlights earned a ‘Good’ rating, which equals to ‘excellent’ in the real world as we can see in the video test below. Above comparison image of the Model 3 headlights test results by IIHS shows that Tesla was able to significantly improve visibility and get rid of the glare that the headlights were affected with, for prior to June 2018 models. The tests are conducted with a distance at which headlights provide at least 5 lux illumination — IIHS provides the full details on how they perform this test here. Looking at the detailed test results on the IIHS website and tables below we can see that the latest Model 3 headlights can provide max front illumination of 178.3 m (584.9 ft) vs. the older lamps which were only able to go as far as 144.2 m (473 ft) which is a significant improvement, other visibility metrics have also been optimized. The only drawback with Model 3 headlights is that they are ‘not adaptive headlights’, but the Auto High Beam feature is available which detects vehicles and oncoming traffic ahead. According to Bjørn’s assessment, these Model 3 headlights are comparable to the Tesla Model X and facelifted Model S as well but Europe and United States have different regulations for headlight standards which he explains in the video.